Breakfast is the most important meal of the day. It’s the fuel you need to start the day along with maybe a big cup of coffee (or two)! Starting your day with a good balanced breakfast will keep you energized and ready to focus on the day ahead. We know mornings can be busy! Getting up and ready along with getting the kiddos up and out of bed and ready for school can make mornings crazy! It’s so important to make sure everyone eats breakfast before heading out the door for the day or else you’ll be in a mid-morning slump before it’s even lunchtime. Creating some easy and delicious make-ahead breakfasts will make your busy mornings easier and out of the drive thru! These make-ahead breakfast ideas will benefit you whether you’re following our meal planning series or not. If you are following our meal planning series planning you’ll want to make sure you start planning out your breakfast and lunch meals too so you stay on budget with your overall grocery bill. Keep breakfast options limited. You don’t need to feel like you’re a breakfast diner every morning. Have fun creating family favorite breakfast like pancakes, fluffy waffles, frittatas for the weekends and enjoy these 5 easy weekday breakfast ideas during the week! Generously spray a jumbo muffin tin with cooking spray. Crack each egg in each muffin tin and lightly season with a pinch of salt and pepper. Gently whisk each egg to break up the yolk. Bake for 12-14 minutes until cook is cooked and center is set. Let cool slightly that remove from from muffin tin. To assemble cut each muffin or biscuit in half. Place an egg on top of the bottom of english muffin or biscuit. Top with with and a slice of cheese. Add the top and then wrap each securely in plastic wrap. Place muffins or biscuits in a large frozen resealable bag and freeze. To serve and heat, unwrap frozen sandwich from plastic wrap and wrap with a paper towel. Cook in the microwave for 1 minute. Turn over and cook for another 20-40 seconds longer until cooked. Mix oats, milk and maple syrup together in a small mason jar. Place yogurt in a small mason jar. Top with frozen berries and granola. 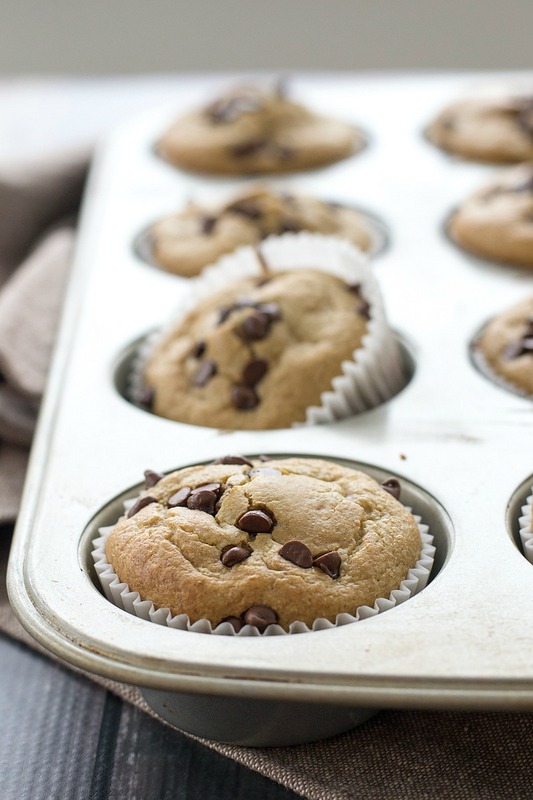 Line a 12-cup muffin pan with paper liners or spray with cooking spray and set aside. Place oats, bananas, yogurt, eggs, brown sugar, vanilla extract, baking powder, baking soda, salt and cinnamon in the blender and blend on high stopping to stir if needed until batter is smooth and creamy. Pour batter evenly in prepared muffin pan and sprinkle mini chocolate chips or chopped walnuts on top if desired. Bake for 13-15 minutes until toothpick inserted into the center of the muffins comes out clean. Place 2 cups berries, bananas and greens in a quart size resealable freezer bag. Label bag and place in the freezer until ready to use. When ready to use, place contents in a blender along with milk and blend until smooth. Place in a cup with a lid to take on the go or enjoy immediately! h5 style=”text-align: center;”>Subscribe to our podcast on iTunes!